What skincare products should I be using? Masks, moisturisers, serums, cleansers – there are so many skincare products available. But, do we need them all? What products are essential to maintaining fresh, glowing and hydrated skin? We explain it all. Cleansers form the first step in your skincare regime. They wash away the impurities left on the skin after a day of working, sweating, and make up, and are vital to maintaining a clean and healthy complexion. Investing in a high-quality cleanser will ensure that you wash away the bad stuff, without also stripping your skin of all the good stuff too. Incorporate daily into your skincare regime. Serums are one of the newer products gaining a lot of hype. They are fantastic for rejuvenating and restoring your skin, particularly when used daily in conjunction with a high-quality moisturiser. There are a range of different serums that focus on integrating different vitamins and minerals back into your skin. The most common include vitamin A, B, C or E. Each serum carries different benefits, so book a consultation with our experts to ensure you invest in the best solution for your skin. Moisturisers play one of the most important roles in keeping your skin healthy. Good quality moisturisers not only keep your skin hydrated, but also protect and rejuvenate. They feed your skin with important vitamins and minerals that nourish long after the first application. When selecting a moisturiser, look for one that contains vitamins A and C for maximum hydration. Avoid products that include silicon or petroleum derivatives as they don’t actually penetrate the skin and deliver hydration. 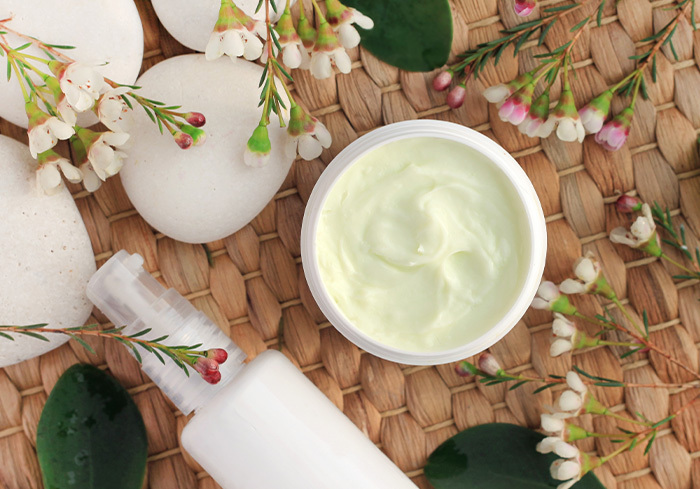 Once you’ve found a good quality moisturiser for your skin type, use morning and night for the best results. Masks are best used weekly in your skin routine. They give your skin an extra boost of nutrients and moisture. Masks also support your daily skincare kit by toning, hydrating and protecting your skin. We recommend you undertake a skin consultation before including masks into your routine to ensure you use the best one for your skin type and goals. This is a must-have in everyone’s skincare kit! Wearing an everyday broad-spectrum SPF is vital in protecting your skin from damaging UVA and UVB rays. Remember, these rays can penetrate through clouds and glass and play a major part in ageing, not to mention the potential to cause skin cancers. Natural, zinc-based sunscreens have anti-inflammatory properties – perfect for protecting and soothing dry and sensitive skin. Ensure you include at a minimum an SPF30+ sunscreen as part of your morning skincare routine. It is important that you understand the current condition of your skin, and the vitamins it might be lacking, before investing in skincare. Book a consultation with our experienced team today to ensure you combine the right mix of treatments and skincare to get your skin looking and feeling its best. Book an appointment with our masters today to learn more about effective skin treatments and how we can help you master the artistry of you™.